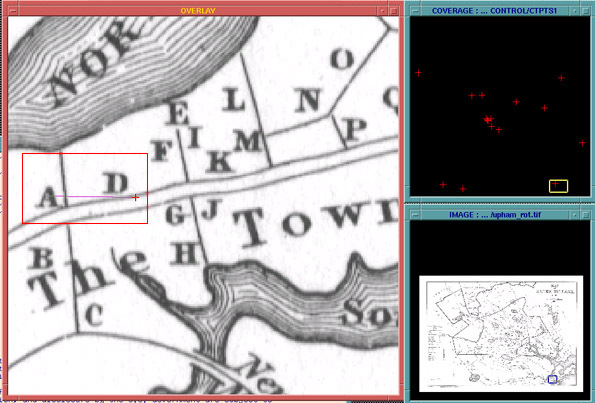 We performed several different registrations of Upham's map, in order to examine the effect of using certain control points and leaving out others. Successive attempts allowed us to determine which points provided the best match and fit of the map to the real world data we had to work with. LEFT: point A on the map image is being linked to the control point (represented by the purple line) to the control point represented by the "+" sign. Ultimately we used only nine of the sixteen available control points to register the map. The remaining seven, we felt, represented large areas that we could not well match with a point, or represented points on Upham's map that appeared to be imprecise or inaccurate. The remaining nine points provide enough geographic spread to ensure accuracy.